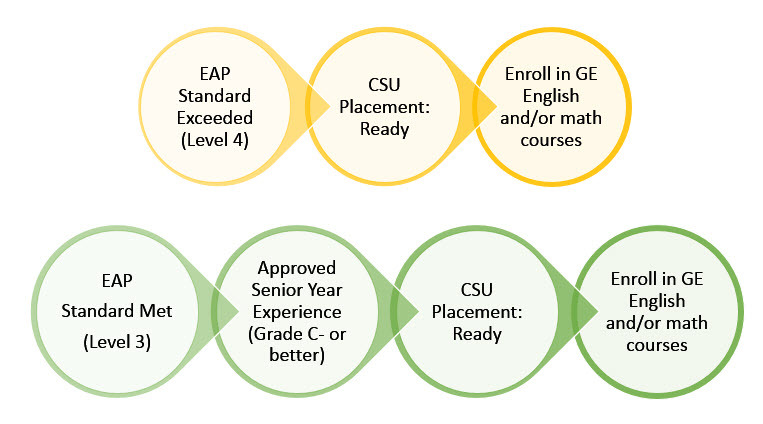 The CSU Early Assessment Program (EAP) was established to provide opportunities for students to measure their readiness for college-level English and mathematics in their junior year of high school, and to offer opportunities for them to improve their skills during their senior year. EAP utilizes the grade 11 Smarter Balanced Summative Assessment in English language arts/literacy (ELA) and mathematics. Testing period is between February through May of the student's high school junior year. EAP scores are included in the CAASPP (California Assessment of Student Performance and Progress) Student Score report. Report is mailed 8 weeks after District testing concludes but no later than August. The CAASPP EAP results, which students have at the start of their senior year, are one of the first measures students may reference to continue to academically prepare their senior year for their first year at a California State University (CSU). Utilizing the CAASPP Student Score Report, students may find their EAP test results. The CSU requires that all entering freshmen students be evaluated in terms of their preparation to complete first-year courses in written communication and mathematics/quantitative reasoning. Course placement is based on multiple measures including standardized test scores such as the CAASPP EAP results. Applicable to Fall 2019 CSU admitted students, placement will be based on multiple measures including standardized test scores as well as high school coursework and grades. CPP wishes our incoming 2020 Broncos luck in the @SmarterBalanced Assessment Consortium testing. Make it count @calstate! @calpolypomona wishes our incoming 2020 Broncos good luck in the SBAC testing. Make it count @thecsu!